Posted on Wednesday, November 21st, 2018 at 1:41 pm. While it feels like we were just basking in the summer sun, Thanksgiving is here! Check out our recommendations on how to pair your Thanksgiving wines with the correct food, and social setting! Pinot Noir is a red wine that is most commonly associated with Thanksgiving festivities, and you can never go wrong with a classic! The bright acidity and gentle tannins complement the bird without stealing the show. 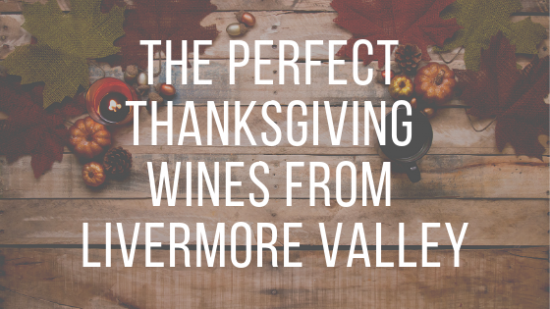 The following Pinot Noir wines from Livermore Valley wineries range from light to medium bodied, and will complement your turkey, no matter how it’s prepared! Looking for a wine that has the fruit of Pinot Noir, but prefer a lighter wine? Try Embodied Wines 2017 Livermore Valley “Corset” Rosé of Pinot Noir. If your guests are looking for a white wine that is a bit less acidic than a traditional Sauvignon Blanc, pick up a bottle of McKahn Family Cellars 2017 Viognier. 6. What Goes Best with Cranberry? Share with us your Thanksgiving plates and pairings with your Livermore Valley Wine Country favorites and tag us using #LivermoreValleyWineCountry & #LiveaLittleMore. We hope that you’re surrounded with the love of your friends and family during Thanksgiving festivities.